Biodiesel Plants - We utilize our own proprietary technology to efficiently product a high quality Biodiesel fuel. Our technology is flexible as well as cost effective for the customer. It can use any raw material (palm oil, soybean oil, sunflower oil, animal fats, etc.) to produce any specified amount of Biodiesel fuel. Our Biodiesel fuel is guaranteed to meet international international quality specifications including: ANP 42/2004, EN 14214, and ASTM D 6751. We have spent years researching and perfecting the technology and have received numerous awards for our excellence in the production of biodiesel fuel. 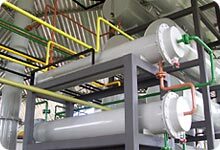 Oil Extraction Plants - We are fully capable of offering a solution for your oil extraction needs. Our plants can extract oil from the raw material (soybean, sunflower, palm, etc.) to be used for any purpose. Combine this with one of our fuel plants (Biodiesel, Methanol, Ethanol, Alcohol) to produce high quality fuel from a raw product. 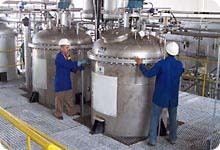 Alcohol Plants - We use a state of the art technology to produce alcohol for the customer. We are representatives of Tomsa Destil, a world renown Spanish construction company. Through Tomsa, we are able to supply Alcohol plants, using any raw material (sugar cane, corn, cassava, beat, potato, etc) for any application (fuel, pharmaceuticals, cosmetic, beverage, etc). We can also provide small or large quantities of Alcohol depending on customer needs. Methanol / Ethanol Plants - Our plants are able to provide our customer's with an affordable way to produce Methanol/Ethanol fuel. We focus on taking the raw material and turning into a high quality end product. We are currently in production of plants across the world with many plants producing this fuel already. Other Services - At Energy Solutions we offer Biofuel or Bioenergy technologies, but we can also help with storage, maintenance, repair, and extra parts for your plant. If you have any questions, please feel free to Contact Us.